Who are we?Netflix is the world's leading internet entertainment service with over 130 million memberships in over 190 countries enjoying TV series, documentaries and feature films across a wide variety of genres and languages. Members can watch as much as they want, anytime, anywhere, on any internet-connected screen. Members can play, pause and resume watching, all without commercials or commitments. The Data Engineering org supports Netflix’s data-driven culture across content, marketing, streaming, product, and finance functions.The Content Knowledge Graph team is focused on building rich, connected, and easily accessible data about content. This connected data is used across multiple functions, from getting content onto the service to feature development for statistical models. The scope of this team’s work is rapidly growing and there are many opportunities for impacting Netflix’s growing global audience and slate of Originals. 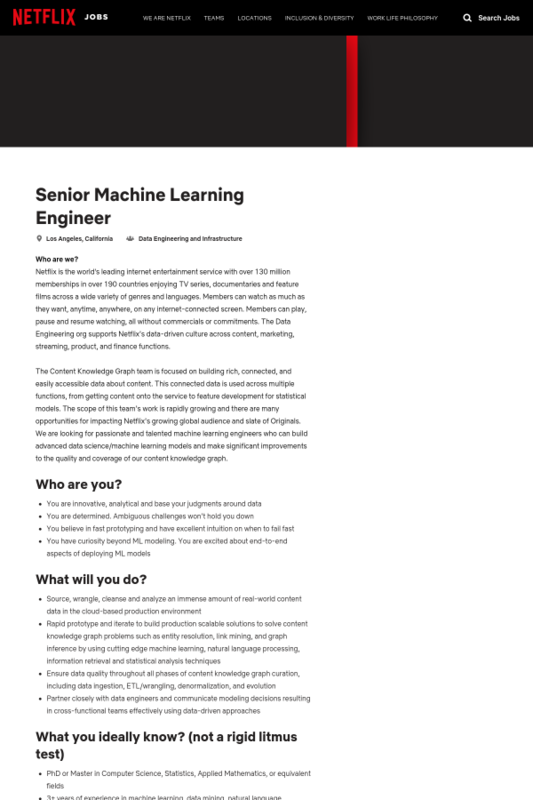 We are looking for passionate and talented machine learning engineers who can build advanced data science/machine learning models and make significant improvements to the quality and coverage of our content knowledge graph.